Mr. Restituto L. Suarez, Jr. of YS Construction turns over today, October 18, 2018, the fully accomplished Philippine Rural Development Project (PRDP) Farm to Market Road (FMR) Subproject in Sagbayan, Bohol to the Department of Agriculture (DA). 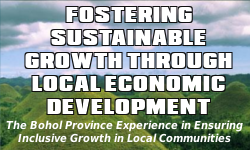 The Province of Bohol is one of the pilot provinces selected by the DA to partner in the implementation of the PRDP, which is funded by the World Bank. 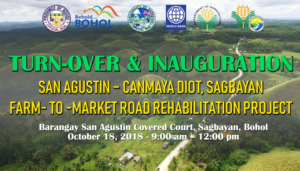 It is the first province in the Central Visayas to have fully accomplished its I-BUILD SubProject Rehabilitation of San Agustin-Canmaya Diot Farm-to-Market Road (FMR) in Sagbayan, Bohol. The DA – PRDP is a 6-year national government platform for an inclusive, value-chain oriented, and climate resilient agriculture and fisheries sector, which is the upscale version of the Mindanao Rural Development Program (MRDP) where new innovations are introduced to address the present demand of times especially climate change to make rural development more effective. The PRDP aims to increase farmers’ income and food security of the rural poor and indigenous communities of the Philippines. It also aims to develop a more market-oriented and climate-resilient agriculture and fishery sector developed in program areas. During the turn-over ceremony, DA 7 OIC-Regional Director Marina Hermoso turned over the project to Governor Edgar Chatto who likewise turned it over to Mayor Ricardo Suarez of Sagbayan. The mayor then finally turned over the FMR project to the four barangay captains of San Agustin, Canmaya Centro, Cahawasan and Canmaya Diot.